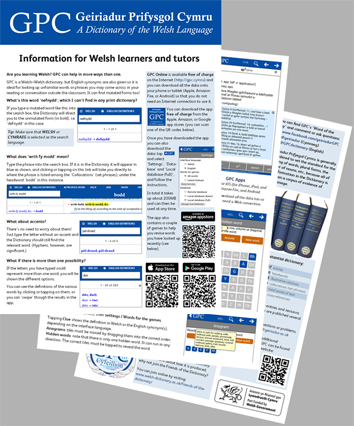 Geiriadur Prifysgol Cymru (the University of Wales Dictionary of the Welsh Language) is a huge academic dictionary and to a large extent a Welsh-Welsh dictionary, yet it can still be useful for learners (and certainly for their tutors) in its electronic format. It is available online and as an app, and offers aids such as help with spelling and mutations. We have prepared two quizzes to help learners practice using the Dictionary, one for beginners and one for more experienced learners. There are two versions of each quiz, one with space to write the answers, and one with the answers. Tutors are welcome to print enough copies for the whole class.